With so much to see and do in the mountains of Tennessee, the best way to enjoy a fun-filled vacation is to book a cabin in the heart of the Smokies. Luckily, Brookstone Village cabins in the Smoky Mountains keep you in the middle of the all the action! The cabin rentals of Brookstone Village are located only a few minutes from the Pigeon Forge Parkway and great area attractions. Whether you are interested in dinner shows, concerts, or spending fun-filled days at Dollywood, these cabins keep you close to town so that you don't waste your hard-earned vacation time driving. Save fuel and time by choosing a well located cabin, such as our cabins in Gatlinburg, TN. There are few better ways to maximize your vacation experience. Brookstone Village Resort cabin rentals are a great choice for staying close to everything that makes the Smokies so incredible. Cabin rentals in this Smoky Mountain resort are well situated for exploring the both the action-packed Parkway and Dollywood theme park! While these cabin rentals are close to downtown, this resort community boasts secluded Smoky Mountain cabins that are nestled in mountain settings with wooded views. Brookstone Village cabins not only offer access to the best shopping, restaurants, and entertainment in the Smokies, but they also provide quick access to the great outdoors as well. The peaceful mountain community of Wears Valley is only a short drive away. Here, visitors will find a gorgeous valley nestled between towering mountains. Along quaint country roads, vacationers will also discover many charming mom and pop shops and unique local restaurants. On top of providing a convenient location for exploring Wears Valley, guests will also enjoy taking a lesser-known entrance into the Great Smoky Mountains National Park into the Metcalf Bottoms picnic area. This entrance to the park is convenient for cabin rentals close to Pigeon Forge and will save guests the hassle of Gatlinburg traffic. Long days of adventure and natural beauty in the Smokies await visitors who book these luxury cabins near Pigeon Forge. These Smoky Mountain cabin amenities are designed to make your stay in the Smokies comfortable, fun, and relaxing. Many of these features that cannot be found in many other local hotels, but are often come standard in cabin rentals. 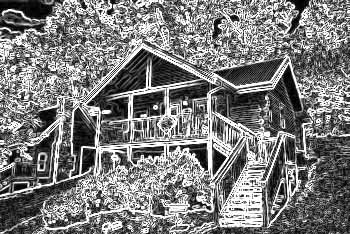 These features guarantee that your affordable cabin in the Smokies is a better value than other accommodations. When you book online with us, you receive an automatic 15% discount off your lodging expenses. Score great savings when you find your ideal vacation rental with Cabins USA Gatlinburg! Book "Mountain Star," a romantic, 1-bedroom, honeymoon cabin close to Dollywood and the Pigeon Forge Parkway. Book & save with our 15% cabin discount! Browse this Bookstone resort cabin: Foxes Den, a 2 bedroom cabin with pool access next to attractions, shows and more. Online Special! Enjoy a stay in a Brookstone Village cabin rental with pool access and hot tub. Stay close to Pigeon Forge and save with our cabin discount! Your gorgeous Pigeon Forge resort cabin, Bear-E-Nice, accommodates up to 10 guest just off the action packed parkway in Brookstone Village Pigeon Forge TN. Enjoy a Smoky Mountain cabin in Brookstone Village resort. With pool access and a hot tub, this cabin sleeps 8 guests in comfort in a great location close to Pigeon Forge!